Camp Kingswood in 2014 is Not Exactly What I Remembered; It’s Better! When I heard that my work team was going to take a trip up to Maine to visit JCC Camp Kingswood, I was very excited. I immediately wanted to be a part of the trip because I was a camper at Kingswood for two summers in the 1990s. The night before my trip up to Bridgton, Maine, I could not get any sleep. I was still wide awake when my colleague, Claire, and I met the bus at the JCC in Newton. While on the bus up to Maine I met the wonderful people from the JCC who invited us to join them including 3 energetic women named Rachel. The trip to camp took under three hours most of us took naps and munched on breakfast snacks. The first thing I said when we got off the bus (to no one and everyone at the same time) was that I thought the camp looked smaller than I remembered. Someone responded that was that I was much smaller 20 years ago then I am today. Twenty years and a few extra inches in height can make a big difference in how you see things. As we walked around the camp grounds of 2014, we got to enter a girls cabin. That was always forbidden back in my days as a camper (and probably still is for campers there). We also got to see the director’s cabin, which was a real treat because as a camper I always wondered how the camp director lived during the summer. Those old thoughts and feelings came back while we looked around. My time at Camp Kingswood was fun, but I was always very homesick, crying for my parents and my life back in Massachusetts. I remember that I hated playing sports but never had much of a choice of activities. While listening to a presentation by the camp director, Leslie, I was amazed at how flexible and customizable the 2014 camp experience is. It is also much more inclusive. I could not believe that they are so accepting of all kinds of abilities. Reflecting on what I took away from my visiting Camp Kingswood, I realized that people are more accepting of different interests and abilities then they were 20 years ago. I wish I could be a camper now because I would not have to play sports. Instead I could focus most of my time on activities that interest me. I would also be surrounded by a more diverse group of campers. I look forward to sending my child to Jewish overnight camp at a camp like Camp JCC Maccabi Kingswood giving them the opportunity to create the experience they want to create. 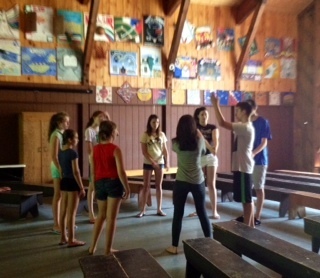 What makes Jewish camp Jewish? Revisited.